I'll sign off now and leave you to enjoy the rest of Off The Ball. The top six looks done and dusted, although Motherwell can still catch Hibs but they would need to beat Aberdeen and Rangers and hope the Easter Road side get nothing from games against Kilmarnock and Hearts. Just one more game to complete the Premiership weekend tomorrow and it's a biggie. Leaders Celtic host Glasgow rivals Rangers in a noon kick-off. There are always sub-plots galore in these games but the bottom line is that Celtic lead by 10 points and will be extremely confident of wrapping up an eighth successive title if they avoid defeat to their closest challengers. This is the third Old Firm meeting of the season with the home side winning 1-0 in the prior games. As ever, we'll have radio and text coverage for you. There's no sign of a Derek McInnes interview yet. The Aberdeen manager may well be giving his players a stern talking to in the Tynecastle dressing room. It's not often the Dons lose after scoring first... My colleagues reckon the last time that happened was the Scottish Cup final in 2017. Dundee manager Jim McIntyre tells BBC Scotland: "I'm obviously gutted we lost the game, but we deservedly lost it. 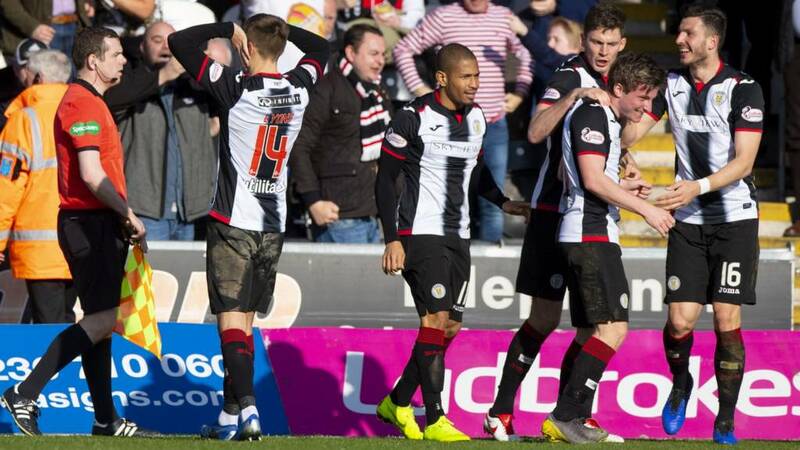 Once they scored in the second half, St Mirren were the better side. Our reaction was poor. "That's what happens at this stage of the season, nerves kick in. The players have got to stand up and be counted. We've got to be better in those key situations. The second goal is ridiculous. "But it's not done, it's not done by a long shot. We'll pick ourselves up and go again." St Mirren manager Oran Kearney is a picture of calm after picking up three points in the basement battle. The Buddies are now two points in front of Dundee and four behind Hamilton after recovering from the loss of a goal inside the first minute. Kearney tells BBC Scotland: "We all crave that momentum and that springboard to kick forward. The three points today will hopefully give us that. "We wasted the first half. But I thought the way we got ourselves back into the game was brilliant. There were some huge performances. "There's no wild celebrations. It's more of a tired changing room than an ecstatic one." Motherwell manager Stephen Robinson tells Sportsound that his three second-half changes flipped the game in their favour. "First half we played in front of them too much," he explains. "We were too slow with our play and lacked a bit of movement and creativity. "We sorted that out at half-time. We didn’t start the second half well but once we got going the three subs were excellent and changed the game for us. Elliott Frear, Chris Cadden and Carl McHugh were all great. The two wide players gave us the penetration that was missing. "The three goals were excellent. We started putting balls into the strikers’ feet and that was probably the difference." Motherwell's Chris Cadden returns from injury.Image caption: Motherwell's Chris Cadden returns from injury. St Johnstone manager Tommy Wright is not a happy man. Liam Craig missed from the penalty spot and the visitors kind of caved in once Motherwell went in front. "It wasn't a great penalty," he says of the weak first-half effort. "That's two we've missed against Motherwell this season. "There was very little in it, first half, second half we came out and were the better side. Kane should score. After that, it's totally unacceptable from us. The players have got to stand up and take responsibility. The last 20 minutes was a non-event. There was no reaction at all. "There's maybe too many of them who think they've arrived in the game and they got what they deserved." Hamilton Academical manager Brian Rice is in a gloomy mood as he tells BBC Scotland: "Very, very disappointed. "Only one team looked as though they wanted to be out there. Roll your sleeves up, go and play football and go and win a football game and it wasn't us. "We're fighting for our lives. I expected a lot, lot more. I'm lost for words at how we performed." Kilmarnock assistant manager Alex Dyer tells BBC Scotland: "The gaffer's a little bit under the weather but the boys came out and performed. They did everything right. "Apart from scoring the goals, they created a lot of chances and, to a man, they were outstanding. We want to finish the season as high as we can." Killie are now third in the table with a midweek trip to Hibs and a home game with St Johnstone to come before the split. Hearts manager Craig Levein tells Sportsound he's "delighted" with his team's performance. "I didn’t think there was much in first half but Aberdeen took their chance," he says. "We’ve come off a poor result at Hamilton and I felt we were negative as a result of that in the first half but in the second half we played higher, were braver and got more opportunities. "I thought John Beaton refereed the game well. But Uche Ikpeazu gets fouled, centre backs are doubling up on him and he doesn’t get a fair crack of the whip. For me, it was a stonewall penalty (when Ikepeazu was booked for diving). "We’ve got a big week ahead of us, so a lot of things to look forward to." Hearts visit Ibrox on Wednesday before an Edinburgh derby at Tynecastle next weekend. Hearts manager Craig Levein reports that match-winner Uche Ikpeazu is "a bit dazed" after being withdrawn after a nasty clash of heads. Partick Thistle and Queen of the South picked up valuable wins to ease some of the strain at the bottom end of the table. Alloa stay stuck in last place despite beating leaders Ross County and Dundee United fans will be sick after they failed to take advantage of that shock result. Hearts are back up to fifth after a stirring second-half comeback at Tynecastle. Craig Levein's men are just two points behind the Dons now. Aberdeen were on top for half an hour but lost their way as match-winner Uche Ikpeazu roughed them up. The Buddies come from behind to move off the bottom of the table. Trailing their visitors by a point before the game, the home support feared the worst when Ethan Robson put Dundee ahead within the opening minute. But Danny Mullen soon replied before Brad Lyons turned the game around. With seven games to go, it could be a huge three points come the end of he season for Oran Kearney's side. And, with Hamilton losing to Kilmarnock, Saints cut the gap on 10th-place Accies to four points. Kilmarnock move up to third in the Scottish Premiership after a dominant display against a poor Hamilton side. Five goals and it could have been more for Steve Clarke's side. Kilmarnock sub Mikael Ndjoli drives at the wilting Accies defence and hammers in a fifth goal for the hosts.